I bought a bottle of ktc pure coconut oil but as far as I can tell, it is in solid form and not liquid as I sort of expected. How can I use it? In case anyone has used it, is the oil going to cause the food to impart a coconut flavour? Coconut oil is a saturated fat, which makes it solid at room temperature. Above room temperature, it behaves exactly like any other oil and has a very high smoke point. You don't need to treat it in any special way. I personally just use a knife or spoon to dig a little bit out of the container. Coconut oil is considered to have a neutral flavour (with the exception of some "virgin" coconut oils). It's much weaker than, say, olive oil. 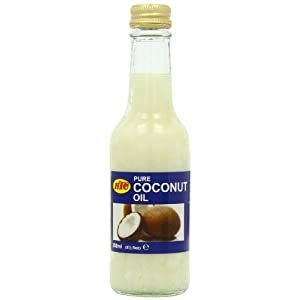 You'll most likely not be able to detect any coconut flavour from oil alone - you have to use something like creamed coconut (a common ingredient in satays) for that. P.S. Although it might appear to be similar to butter or margarine, keep in mind that it is actually a cooking oil, unlike butter which has milk solids that burn, or margarine which is hydrogenated to make it solid. Coconut oil is just barely solid and won't always work as a substitute for those other things. Think of it like butter or shortening -- once you heat it up, it'll melt. I can't answer as to how much coconut flavor it'll give, as the only time I've used it was when it separates in a can of coconut milk -- I cooked with the coconut fat, then stirred the rest of the can into the curry I was making. You can put the bottle into boiling water to melt it and decant it into a glass jar to use more easily. The bottles KTC coconut oil comes in are impossible to get it out unless it's liquid. Here's a long post about KTC coconut oil..
How to remoisten sweetened coconut after opening?